Garuda Citilink is a low cost budget airline based in Jakarta, Indonesia. Having established in 2001, Citilink is the subsidiary of Garuda Indonesia and is for travel around Indonesia. 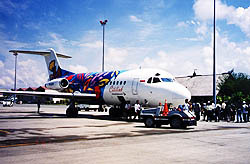 The air transport company has been set up in order to operate shuttle flight services to and fro Indonesian cities.